Liverpool FC have been blessed with some remarkable men down the years. Shankly, Fagan and Dalglish alone would have been enough to ensure unparalleled glory for any club; a pantheon of legends whose achievements in the game will echo into eternity. However, one man stands above them all, delivering unrivalled success in just nine short years. That man was Bob Paisley. Bob left us 20 years ago, but his achievements at the club ensure that he will never be forgotten. Most managers would be happy, at the end of a career spanning decades, if they could sit back and gaze upon 6 League Titles, 6 Charity Shields, 3 European Cups, 1 UEFA Cup, 1 European Super Cup and 3 League Cups. Bob did all of that within just one decade. I’ve read a number of tributes to Bob down the years, but none more touching and emotional that the one I saw from Roy Evans today. In it he describes Paisley as a “modest genius”. Who could argue with that? Bob famously didn’t want the job when Shanks moved on. He’d have been happy to have continued to serve the club and its supporters from the shadows. Instead, when asked to lead, he reluctantly agreed to step up to the challenge. He followed the legend and icon that was Bill Shankly with distinction, surpassing even his trophy haul. In the short video on the club’s official website, Evans goes on to describe his former manager’s many qualities. He could pick a player better than anyone in the game. He’d often make his mind up after just fifteen minutes watching the player. He had a gut instinct and he trusted it. The players often couldn’t understand his accent and team talks were difficult, but they knew exactly what he meant and they believed in him. He was a ‘nice guy’, calming and witty throughout the week; but he would turn to steel on match day. He had all the vision of his predecessor, but his was a quiet charisma. These are the qualities of a true leader. Many Liverpool fans are annoyed that Bob never got a knighthood. In reality such trinkets would have been meaningless to a man whose career had amassed so much silverware. He probably wouldn’t have wanted it anyway. Bob was as quotable as Shanks too. Among my favourites is from the end of his reign. “Some may have made more money in the game, but no one has enjoyed it more than me.” Of course Paisley was driven by success and a fierce desire to win, but ultimately he did it all for the love of the game. There are also many images of Bob that immediately take you back in time. Your heart is filled with warmth and your belly burns with pride. How lucky we were to have been alive while his genius worked its magic all over Europe. However, there is one image over all of the others that sums up what this great man was all about. In fact it completely encapsulates the essence of Liverpool Football Club its self. It is a scene from the 1970’s. The pitch is muddy and the stands are packed with adoring supporters. A bloodied and bruised Emlyn Hughes can no longer continue. His efforts in the match have left him broken. He has the only excuse that would allow any Liverpool player to leave the field of battle with their head held high. He can no longer walk. 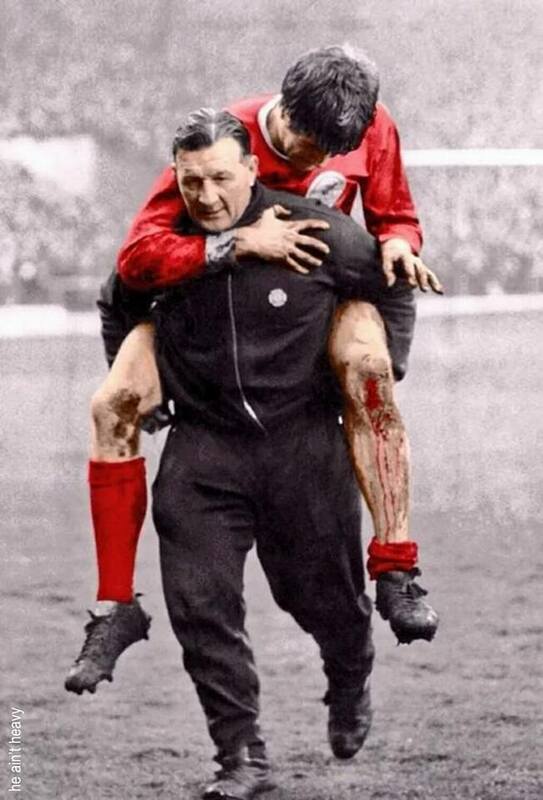 In the image a track suited Bob Paisley is carrying the injured player off the pitch on his shoulders. No stretchers, no medics, no gas and air. Just one hero happy to carry another to safety. Like Shankly before him Bob Paisley’s philosophy was rooted in his early life and forged by experience. He was in the armed forces and knew all too well how important teamwork was. You had to completely trust the men you were leading and they had to have total belief in you. If you ask them to run through brick walls on your behalf, you have be there to pick them up when the time comes. Brian Reade managed to interview Bob towards the end of his life and asked him to describe what Liverpool FC meant to him. The years had taken their toll on the man and his speech, never easy to follow, had become even more challenging. However, Paisley left Reade and all of us one last pearl of wisdom. It went something like this, “It’s like when you’re lost in the fog and you know if you hold on to each other you will find your way home”. That was the incomparable Bob Paisley; that was Liverpool Football club. Two forces of nature who collided in one glorious moment in history. Rest in peace Bob you still make us as happy and proud today as you did back then.